As described in my article Basic Concepts of a Terminal Server Environment, automated installation of operating system and applications is one of the most important concepts to keep your servers 100% identical. A Dutch company called GTS-Gral recognized these concepts and developed a software solution for their customers. Now they released this solution on the market as a commercial software product named TS-Farm Configurator. In this review we will take a look at this product and how it competes with other deployment products. The installation of TS-Farm Configurator is one single MSI file. During installation only the destination location needs to be specified. After the installation the administrative console is installed, where you need to specify a file share and the license file. GTS-Gral has created their own boot CD for installing the Terminal Servers. If you want to use this CD for installation the server hosting the share should be reachable via TSCFserver (can be accomplished via a CNAME or A record in DNS) and the share should have the name TSFCShare. Also a user needs to be created with the name TSFCAdmin and a fixed password. Logically this user needs to have enough rights to access the share. Also the installation source of the Operating System should be copied in the directory for that operating system. I would advise to install the program (actually the administrative console) on your management server where also other system maintenance tools are installed. The share can be placed on any server within your domain. After these steps you are ready for preparing the configuration. As already described in the installation paragraph first you need to specify the file share and the license file before all other configuration parts are available. The starting point is to create a Farm. Logically you almost think about Citrix, but a Farm in this situation is just a collection of servers which belong to the same domain and/or customer. Within this configuration part you need to fill in the organization name and an admin account of your domain. This account must have permissions to add computer objects to Active Directory and local admin rights (This can be accomplished for example through restricted groups in a group policy). Secondly you need to specify the hardware available in your infrastructure. With this option you can specify the location (of OEM) drivers like Network Interface cards, video drivers and Mass Storage Devices per hardware type. Also applications should be added to your Terminal Servers. In the part Packages applications can be added. The source should be added to the file share in the package folder. Within this package directory you need to create a new folder and copy the installation files into this folder. TS Farm Configurator can handle MSI, exe or CMD files, so you can almost use every package methodology you like. Remember that you can only use MSI directly if no intervention is necessary. In other words only customized MSI can be added directly, for the others you should create a little script and the MSIEXEC command line tool. If you would like to use Citrix Presentation Server you should add this part as an application using the unattended options. 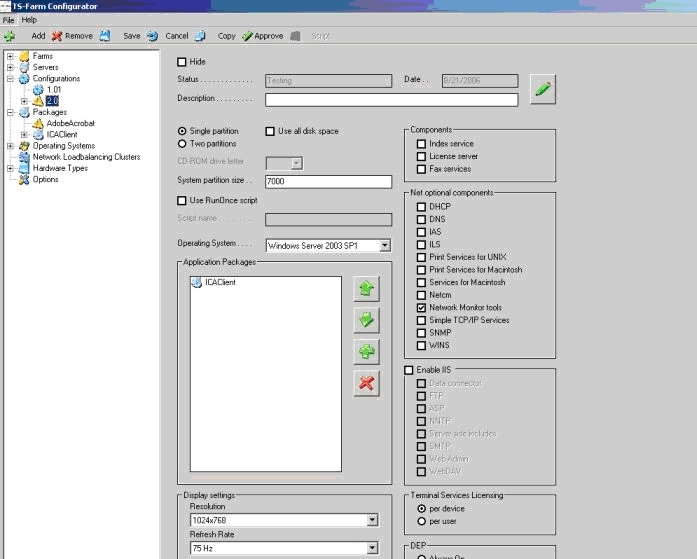 Within the configuration part you need to combine your operating system settings with the package. If you add a configuration you need to specify a version number and you can add all other components. First of all you need to specify the disk partitions. It is a pity that you only can assign the CD-Rom drive letter if you specify two disks, I can think of situations where with one partition you would like to give the CD-Rom drive another driver letter. Also if you are rolling out the server you need to change the drive letter of the CD-ROM manually, so this option is not fully developed. After selecting the desired Operating System several Windows components can be added to the installation. Terminal Services are always enabled within TS-Farm Configurator. I think many companies would like to have the option to enable or disable Terminal Services, because in this way the software can also be used to install all their servers. After adding the packages, the display and the terminal server license mode can also be specified. When the configuration is fully tested, the configuration needs to be approved. After approval the configuration can not be changed anymore. The same option is available at the packages part. At the server part all configuration items are combined in the server component. After specifying the server name you specify which hardware profile should be used, which configuration needs to be applied and to which farm the server belongs. Within this part also the NIC configuration of the server will be set here. Remember to specify the MAC addresses so the installation knows to bind the configuration to which NIC. Also the first MAC address is used during the installation to determine which server needs to be installed. If you would like to use MS Network Load Balancing (for example on Terminal Server without addition SBC software) it also possible to specify the configuration and connect this to the server component. Now all configurations are combined you need to press the button Script to create the necessary files for the unattended installation of the server. During this phase the unattended.txt is written for the Windows installation, diskpart.txt for the configuration of the disks and also a script is created for the steps after the Windows installation. Now it's time the turn on the server. When starting the server with the boot disk the server is getting a DHCP address, followed by connecting to the file share. Using the MAC address the installation determines which configuration is available for this server and the Windows installation is started. If Windows is completely installed the server will be restarted and the applications will be installed. Earlier I mentioned that after approval no changes can be done to the configurations and that the applications are installed after the Windows installation is finished. If your production environment is up and running the software is not provided with a mechanism to upgrade an existing installation or install new applications. GTS-Gral did not includes this mechanism because the use the concept of complete new rollout when a new application or update is available. The idea is that after testing and accepting a new server configuration (complete with applications) there is only one way to take it into production. A complete new rollout of the servers with the new configuration. 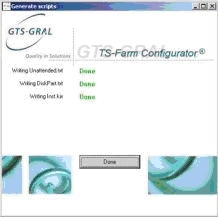 With TS Farm Configurator GTS-Gral has released a software product which can be used to deploy your Terminal Server infrastructure with an operating system and applications in such a way all servers are equal. The software is small and easy to install. 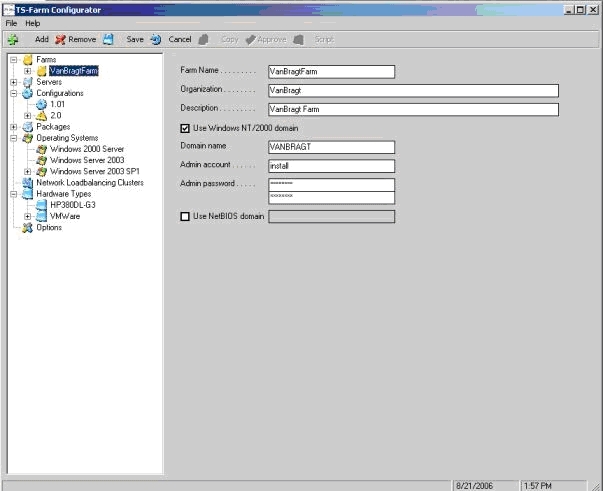 The product has a clear user interface which makes it is easily to create a Windows 2003 installation including installation of the applications. The support of several installation resources like CMD script is also a big plus. Unfortunately TS Farm Configurator does not provide a mechanism to keep the server equal after the initial deployment when new application should be added or updates of application should be applied. Out of experience the most difficult is to keep your servers equal because system maintenance is carried out by the system administrators (no project employees anymore) and the pressures by the business is there again. Also I think many companies would like to use the software also to deploy other Windows servers. 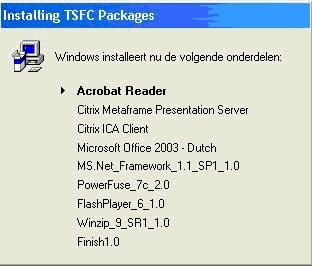 The addition of a GUI for the complete (unattended) Citrix installation would also be a wonderful addition. * After contact with GTS-GRAL the told me that this features are included in the next version 4.0, which is scheduled for begin of Q4 of 2006.